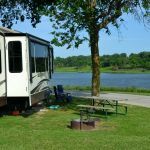 Ask fellow campers about "Lake Anita State Park" and nearby attractions. Not a big rig friendly park. There are just about six spots that you can try and back a big rig into. The problem is that road is the width of your rig with no ability to swing and follow the trailer in. They are on tiered bluffs that quickly leave your tow vehicle over the edge on soft grass. Big mud pit when it rains. Gravel just turns to soggy cement. Cross this off our list. 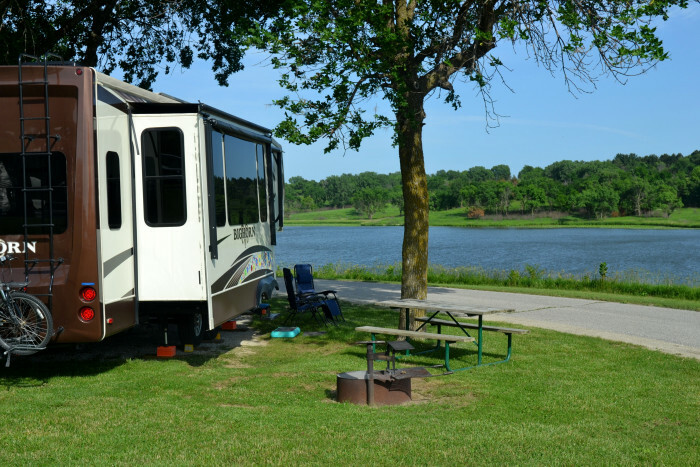 We camped at Lake Anita State Park in a Fifth Wheel. Beautiful park just a few miles off of I80. We stopped for a single night on a larger trip. The lake and view was nice. We camped at Lake Anita State Park in a Motorhome. The lake is what brings water lovers and anglers from all over Iowa here. When you drive in there isn't an official check in gate, but signage points you towards the campground. Once you enter there is self check in kiosk as well as a printed sheet listing all the reserved sites. The campground has a mixture of full hook up sites, sites with only electric and a tent camping section. If you need to take on water like we did, you'll actually have to drive through the campground and follow the exit and then come to the dump station where there is a fresh water fill. Most of the sites for RVs are a bit tight but most all of them provide nice views of the lake. 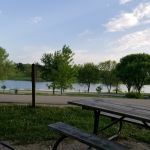 The lake has a great paved 4 mile trail around it, which we enjoyed on bike a couple times and in the morning you'll love watching the rabbits, deer and the amazing number of birds along the path. There is also a bike/hike trail that goes into the small town of Anita. The swimming area was well maintained and quite popular on the days we were there. We camped at Lake Anita State Park in a Fifth Wheel. Take a morning bike ride on the trail into the town of Anita and enjoy a great breakfast at the Weather Vane Cafe. There is also a good Iowa steakhouse in town called the Redwood that I would go back for just for the relish tray they bring out to every table. The campground is close enough for a day trip to Madison County too, where you can spend an afternoon exploring covered bridges. Absolutely beautiful park, very quiet with clean and spacious sites. Easy to get to with nice views of the lake once your in your site and all set up. We used it as an overnight stop on our way out west and it was a nice relaxing stop. We thought this campground rated in our top 10 of places we've ever camped. Would definitely stay here again. We camped at Lake Anita State Park in a Travel Trailer. This is a nice state park on a lovely lake and very quiet. Full hookup utilities worked well but no cable or WiFi but a few channels on the batwing. Campground is well maintained and bath/shower facilities are clean but no hot water in the showers (I let it run for 10 minutes hoping for some). Nice roomy sites, paved roads and gravel pads. Located about 1 mile south of the town of Anita. The bugs were bad but they weren't the biting kind. Paid $19 for camping and a $4 reservation fee but reservations weren't needed (maybe so on weekends). I'd rate higher if it weren't for the cold showers. We camped at Lake Anita State Park in a Travel Trailer. There is a roomy gas station on the west end of town. Great state park with some full hookups. Quiet park with great phone and TV antenna reception. South of town, look for sign on right coming down hill. No check-in building, come half way in to big sign board. We camped at Lake Anita State Park in a Fifth Wheel. Walmart in Atlantic Is. 12mi. West. There was very poor signage from the town to the park. We headed west of town; we should have gone south. We couldn't get reservations here so were urged to arrive before 6 PM to beat the local folks. This park is certainly well used. We will never return to this park for one reason - TRAINS! They were tooting all night long. If you're deaf, this park would be fine. We camped at Lake Anita State Park in a Travel Trailer. Beautiful campground just off the lake. Campground has tight/narrow roads which made it difficult getting into our site. No staff or station was available upon check-in. Small town grocery store and gas station nearby, within 5 miles. Campground about 10 minutes from major freeway. DirecTV (free standing satellite) had no issue. Verizon phone was able to get 4G signal. Boat ramp and fishing available within the park. Many of the campsites are covered by full trees that produce shade. Our site had full service at a good price. We camped at Lake Anita State Park in a Fifth Wheel. We wanted a quiet night's sleep in a peaceful setting and found it. Only 5 miles off the interstate, we had a great night sleep overlooking the lake surround by gently rising green hills. I read the previous review regarding the loops not connecting, we were careful to take the electricity loop. Hint: Don't miss the second sign. Lowest tier is electric only, and these back-in sites are closest to the lake. The gravel campsites looked level and were somewhat widely spaced. The next higher loop has sites with hook-ups of electricity, water. The gravel campsites looked level and were rather closely spaced. These tiers are terraced more like rolling hills, in that they are green grassy and well mowed. The tiers allow the upper trailers to look to the lake and over top the lower trailers. Tiers also add a lower-trailer sense of privacy from the back of the sites. We stayed mid-week, and most of the electric only sites were open but marked reserved for the weekend. A few campers had campfires, and the smoke was not overwhelming. My Verizon MiFi signal was strong. We will return, next time for a longer stay. We camped at Lake Anita State Park in a Travel Trailer. Wow, nice state park. Well cared for, quiet and full hookups. We had all the major stations out of Omaha. Plenty of driveways, bike paths to walk the dogs. I'll have to give state parks a second look if they are anything like this. We camped at Lake Anita State Park in a Fifth Wheel. Good price for full hookup site overlooking pleasant lake. First come, first served, but we had no trouble getting a spot arriving at about 3 pm. We did not want to unhook and there were a limited number of sites long enough. Very family friendly. Sites fairly close together. Most have shade but good southern sky available. Lots of wood smoke. Nice. We camped at Lake Anita State Park in a Travel Trailer. This campground is about 5 miles from the expressway and easy to get to. We stayed in site 143 which was on the lake and very near the restrooms (near camphost). We did not want to unhook so we needed a site that was about 50 feet long and this worked fine (was about 55-60 feet). The restrooms are in very good shape and very clean. The campsites are in terraces overlooking the lake. Each terrace is one way and if you want to get to a different terrace you need to go completely out of campground and then back in. The bottom terrace by the lake appears to have the longest sites and since we arrived in an off season there were many sites to choose from. We selected on near the restroom. There were 3 different sites, electric, full and non electric. You can reserve a particular site if you do so 2 days ahead of time which I recommend. Otherwise, you pick up a registration card and go find a site that is not occupied or reserved and fill out the card and put money in an envelope and drop it off with the camp host or back at the registration site. This system is a bit inconvenient for a single night, but since the camp host took the filled out card and we were right next to them it worked ok. All the sites are back in that we could see and the higher terraces were a little tight if you are not used to backing a large rig in. It was a beautiful and very quiet camp site. 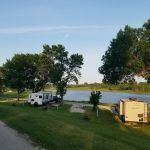 We camped at Lake Anita State Park in a Fifth Wheel. Nice park, the view from most sites is real nice. While there is no cable TV, the over the air reception was excellent. The park is a bit out of the way if you are traveling along I-80 but provided a good rest for us. My only complaints would be the bathrooms by the playground were not very nice or clean. Also the sites are not very level. I did notice another "Bath house" on the way out that I did not check out. Over all good place for the price. We camped at Lake Anita State Park in a Motorhome. This was a lovely place. Well maintained beautiful park. We had a view of the lake. Good water, electricity and sewer. Very quiet. The site we had was a little tricky to back our 38 foot rig into. And their reservation system and/or payment if you don't have a reservation is really difficult to understand. The directions to the sites could be better marked. I had to get out of the car and run around trying to find out site and the sites are on different tiers of the road. But we would certainly go back. Lovely spot. We camped at Lake Anita State Park in a Motorhome. 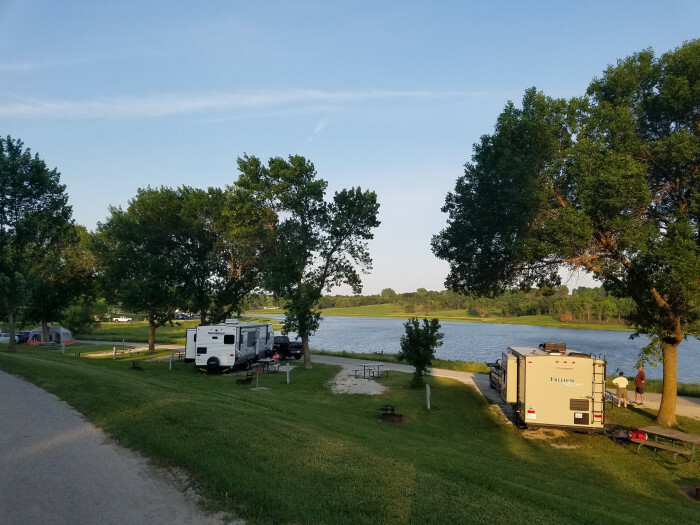 Based on RVparkReviews we checked out this Iowa State Park, and liked what we found. Stayed a week in a full hookup, back-in site that faced the lake. I think there's only 30amps here, however neither ours nor the 43-foot big-rig a couple spaces down seemed to need more juice this time of year. First tier of campsites back up to new playground equipment and block-style bathrooms/showers. We used neither, however both were cleaned regularly and neat. Lush grasses, groomed trees and trimmed landscaping grace the ample spaces between sites and add to the entire ambiance at this 1062-acre park surrounding an 171-acre, no-wake Lake Anita. Understand the lake is stocked with largemouth bass, crappies, bluegill: a popular fishing hole with concrete boat ramps. Great blue heron, deer, squirrels and the occasional fisherman greet you on the bike/walking trails. Separate areas for tent camping and day-use picnicking with several strategically placed dumpstations at exit points. Little town of Anita's 18-hole golf course is just over the hill, however not accessible from the State Park area. There were no additional fees for visitors, day-use, pets, or even extra kids. Sturdy fire-pits with grates at each campsite, and better yet, there are several cute eateries less than a mile away in town. Clear view of the southern sky for satellite TV and full-reception on Verizon air-card and cell phones. Are we in Heaven? No, just Iowa. We camped at Lake Anita State Park in a Motorhome. Are you affiliated with Lake Anita State Park ?